Salvation Army cy pres Award Presentation - Law Office of Scott Johni, P.A. The life of one class action case: 12 years of litigation, 3 trials, 9 appeals, removal to Federal Court, remanded to State Court, and nearly 1 year to distribute funds for a win for the 65,0000 class members. Johnilaw is proud to have assembled the trial team and honored with the lead plaintiff, Fred Williams, to make an impact in the lives of Floridians. 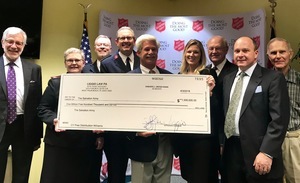 In the last 45 days, the trial team of Scott Johni, the Whittemore Law Group and Liggio Law has distributed over 3.7 million dollars in cy pres awards to Florida non-profits, including the Salvation Army (pictured here), The Florida Bar Foundation, The Tampa Chapter of the American Board of Trial Advocates (ABOTA), Florida Justice Association Research and Education Foundation, and 14 Legal Aid Societies. The cy pres awards were a result of unclaimed funds being donated to organizations that assist families across the state in all 67 counties.This check for $1,500,000.00 will help over a 100,000 Floridians with their utility bills, provide access to civil justice for the underprivileged and access to court, promote attorney professionalism, and provide legal aid for consumer advocacy Thank you to our good friend and client, Fred Williams, for making that phone call to my office and having the fortitude and dedication to see this through. At Johnilaw, we will work hard for you.